For other uses, see Pentateuch. The Samaritan Pentateuch, also known as the Samaritan Torah (Hebrew: תורה שומרונית torah shomronit), is a text of the first five books of the Hebrew Bible, written in the Samaritan alphabet and used as scripture by the Samaritans. It constitutes their entire biblical canon. Some six thousand differences exist between the Samaritan and the Masoretic Text. Most are minor variations in the spelling of words or grammatical constructions, but others involve significant semantic changes, such as the uniquely Samaritan commandment to construct an altar on Mount Gerizim. Nearly two thousand of these textual variations agree with the Koine Greek Septuagint and some are shared with the Latin Vulgate. Throughout their history, Samaritans have made use of translations of the Samaritan Pentateuch into Aramaic, Greek and Arabic as well as liturgical and exegetical works based upon it. It first became known to the Western world in 1631, proving the first example of the Samaritan alphabet and sparking an intense theological debate regarding its relative age versus the Masoretic text. This first published copy, much later labelled as Codex B by August von Gall, became the source of most Western critical editions of the Samaritan Pentateuch until the latter half of the 20th century; today the codex is held in the Bibliothèque nationale de France. Some Pentateuchal manuscripts discovered among the Dead Sea Scrolls have been identified as bearing a "pre-Samaritan" text type. Wide agreement now exists among textual critics that the Samaritan Pentateuch represents an authentic ancient textual tradition despite the presence of some unique variants introduced by the Samaritans. Samaritans believe that God authored their Pentateuch and gave Moses the first copy along with the two tablets containing the Ten Commandments. They believe that they preserve this divinely composed text uncorrupted to the present day. Samaritans commonly refer to their Pentateuch as קושטה ("The Truth"). According to a view based on the biblical Book of Ezra (Ezra 4:11), the Samaritans are the people of Samaria who parted ways with the people of Judah (the Judahites) in the Persian period. The Samaritans believe that it was not they, but the Jews, who separated from the authentic stream of Judaism, around the time of Eli, in the 11th century BCE. Jews have traditionally connected the origin of the Samaritans with the later events described in 2 Kings 17:24–41 claiming that the Samaritans are not related to the Israelites, but to those brought to Samaria by the Assyrians. Modern scholarship connects the formation of the Samaritan community with events which followed the Babylonian Captivity. One view is that the Samaritans are the people of the Kingdom of Israel who separated from the Judaites (people of Judah). Another view is that the event happened somewhere around 432 BCE, when Manasseh, the son-in-law of Sanballat, went off to found a community in Samaria, as related in Nehemiah 13:28 and Josephus. Josephus himself, however, dates this event and the building of the temple at Shechem to the time of Alexander the Great. Others believe that the real schism between the peoples did not take place until Hasmonean times when the Gerizim temple was destroyed in 128 BCE by John Hyrcanus. The script of the Samaritan Pentateuch, its close connections at many points with the Septuagint, and its even closer agreements with the present Hebrew text, all suggest a date about 122 BCE. The adoption of the Pentateuch as the sacred text of the Samaritans before their final schism with the Palestinian Jewish community provides evidence that it was already widely accepted as a canonical authority in that region. Manuscripts of the Samaritan Pentateuch are written in a different Hebrew script than is used in other Hebrew Pentateuchs. Samaritans employ the Samaritan alphabet which is derived from the Paleo-Hebrew alphabet used by the Israelite community prior to the Babylonian captivity. Afterwards, Jews adopted a script based on the Aramaic alphabet that developed into the Hebrew alphabet. Originally all manuscripts of the Samaritan Pentateuch consisted of unvocalized text written using only the letters of the Samaritan alphabet. Beginning in the 12th century, some manuscripts show a partial vocalization resembling the Jewish Tiberian vocalization used in Masoretic manuscripts. More recently a few manuscripts have been produced with full vocalization. However, many extant manuscripts show no tendency towards vocalization. The Pentateuchal text is divided into 904 paragraphs. Divisions between sections of text are marked with various combinations of lines, dots or an asterisk; a dot is used to indicate the separation between words. The critical apparatus accompanying the London Polyglot's publication of the Samaritan Pentateuch lists six thousand instances where the Samaritan differs from the Masoretic Text. However, as different printed editions of the Samaritan Pentateuch are based upon different sets of manuscripts, the precise number varies significantly from one edition to another. More matres lectionis in the Samaritan Pentateuch to indicate vowels compared with the Masoretic. 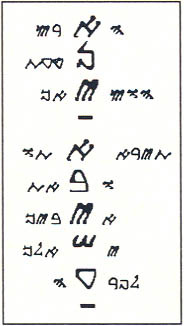 Loss of the gutturals in spoken Samaritan Hebrew influenced how Samaritan scribes transcribed words containing these letters. Scribal errors caused by the mistaking of one Hebrew letter for another with a similar appearance. Scribal errors resulting in the transposition of letters in a word, or words in a sentence. Replacement of archaic Hebrew grammatical constructions with more modern ones. Textual adjustments to resolve grammatical difficulties and replace rare grammatical forms with more common ones. A variety of minor grammatical variations such as the Samaritan's preference for the Hebrew preposition 'al where the Masoretic has 'el. And when it so happens that LORD God brings you to the land of Canaan, which you are coming to possess, you shall set up there for you great stones and plaster them with plaster and you write on the stones all words of this law. And it becomes for you that across the Jordan you shall raise these stones, which I command you today, in mountain Gerizim. And you build there the altar to the LORD God of you. Altar of stones. Not you shall wave on them iron. With whole stones you shall build the altar to LORD God of you. And you bring on it ascend offerings to LORD God of you, and you sacrifice peace offerings, and you eat there and you rejoice before the face of the LORD God of you. The mountain this is across the Jordan behind the way of the rising of the sun, in the land of Canaan who is dwelling in the desert before the Galgal, beside Alvin-Mara, before Sechem. This commandment is absent from the corresponding text of the Ten Commandments in the Masoretic. The Samaritan Pentateuch's inclusion of the Gerizim variation within the Ten Commandments places additional emphasis on the divine sanction given to that community's place of worship. This variation has similarities to Deuteronomy 27:2-8 and is supported by changes to the verbal tense within the Samaritan text of Deuteronomy indicating that God has already chosen this place. The future tense ("will choose") is used in the Masoretic. And whereas Deuteronomy 27:4 in the Masoretic commands an altar to be constructed on Mount Ebal, the Samaritan texts has Mount Gerizim. In (Exodus 23:19) Samaritan Pentateuch contains the following passage after the prohibition: [כי עשה זאת כזבח שכח ועברה היא לאלהי יעקב] which roughly translates "that one doing this as sacrifice forgets and enrages God of Jacob". In (Numbers 4:14) Samaritan Pentateuch contains the following passage: [ולקחו בגד ארגמן וכסו את הכיור ואת כנו ונתנו אתם אל מכסה עור תחש ונתנו על המוט] which roughly translates "And they will take a purple covering and cover the laver and his foot, and they cover it in Tachash skins, and they put it upon a bar." Several other types of differences are found. The Samaritan Pentateuch uses less anthropomorphic language in descriptions of God with intermediaries performing actions the Masoretic version attributes directly to God. Where the Masoretic describes Yahweh as a "man of war" (Exodus 15:3), the Samaritan has "hero of war", a phrase applied to spiritual beings, and in Numbers 23:4, the Samaritan reading "The Angel of God found Balaam" contrasts with the Masoretic "And God met Balaam." A few differences reflect Samaritan notions of propriety, such as the alteration in Genesis 50:23 of the Masoretic "upon the knees of Joseph" to "in the days of Joseph." Samaritan scribes, who interpreted this verse literally, found it improper that the mother of Joseph's grandchildren would give birth on his knees. Distinctive variants in the Samaritan are also found in certain legal texts where Samaritan practice varies from that prescribed within rabbinical halachic texts. In about thirty-four instances, the Samaritan Pentateuch imports text from parallel or synoptic passages in other parts of the Pentateuch. These textual expansions record conversations and events that are implied or presupposed by other parts of the narrative, but not explicitly recorded in the Masoretic text. For example, the Samaritan text in the Book of Exodus on multiple occasions records Moses repeating to Pharaoh exactly what both the Samaritan and Masoretic record God instructing Moses to tell him. The result is repetitious, but the Samaritan makes it clear that Moses spoke exactly as God commanded him. In addition to these substantial textual expansions, the Samaritan Pentateuch on numerous occasions adds subjects, prepositions, particles, appositives, and the repetition of words and phrases within a single passage to clarify the meaning of the text. "Now the sojourning of the children of Israel and of their fathers which they had dwelt in the land of Canaan and in Egypt was four hundred and thirty years." "Now the sojourning of the children of Israel, who dwelt in Egypt, was four hundred and thirty years." Some passages in the Latin Vulgate show agreements with the Samaritan against the Masoretic. For example, Genesis 22:2 in the Samaritan has "land of Moreh" (Hebrew: מוראה) while the Masoretic has "land of Moriah" (Hebrew: מריה). "Land of Moreh" is considered to be a Samaritan variant because "Moreh" describes the region around Shechem, where Mount Gerizim is situated. The Vulgate translates this phrase as in terram visionis ("in the land of vision") which implies that Jerome was familiar with the reading "Moreh", a Hebrew word whose trilateral root suggests "vision." The earliest recorded assessments of the Samaritan Pentateuch are found in rabbinical literature and Christian patristic writings of the first millennium CE. The Talmud records Rabbi Eleazar b. Simeon condemning the Samaritan scribes: "You have falsified your Pentateuch...and you have not profited aught by it." Some early Christian writers found the Samaritan Pentateuch useful for textual criticism. Cyril of Alexandria, Procopius of Gaza and others spoke of certain words missing from the Jewish Bible, but present in the Samaritan Pentateuch. Eusebius of Caesarea wrote that the "Greek translation [of the Bible] also differs from the Hebrew, though not so much from the Samaritan" and noted that the Septuagint agrees with the Samaritan Pentateuch in the number of years elapsed from Noah's Flood to Abraham. Christian interest in the Samaritan Pentateuch fell into neglect during the Middle Ages. The publication of a manuscript of the Samaritan Pentateuch in 17th-century Europe reawakened interest in the text and fueled a controversy between Protestants and Roman Catholics over which Old Testament textual traditions are authoritative. Roman Catholics showed a particular interest in the study of the Samaritan Pentateuch on account of the antiquity of the text and its frequent agreements with the Septuagint and the Latin Vulgate, two Bible translations to which Catholics have traditionally ascribed considerable authority. 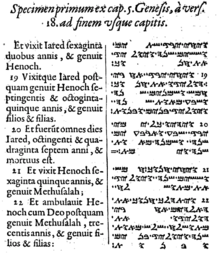 Some Catholics including Jean Morin, a convert from Calvinism to Catholicism, argued that the Samaritan Pentateuch's correspondences with the Latin Vulgate and Septuagint indicated that it represents a more authentic Hebrew text than the Masoretic. Several Protestants replied with a defense of the Masoretic text's authority and argued that the Samaritan text is a late and unreliable derivation from the Masoretic. "We see then that as the evidence of one text destroys the evidence of the other and as there is in fact the authority of versions to oppose to the authority of versions no certain argument or rather no argument at all can be drawn from hence to fix the corruption on either side". Kennicott also states that the reading Gerizim may actually be the original reading, since that is the mountain for proclaiming blessings, and that it is very green and rich of vegetation (as opposed to Mt. Ebal, which is barren and the mountain for proclaiming curses) amongst other arguments. German scholar Wilhelm Gesenius published a study of the Samaritan Pentateuch in 1815 which biblical scholars widely embraced for the next century. He argued that the Septuagint and the Samaritan Pentateuch share a common source in a family of Hebrew manuscripts which he named the "Alexandrino-Samaritanus". In contrast to the proto-Masoretic "Judean" manuscripts carefully preserved and copied in Jerusalem, he regarded the Alexandrino-Samaritanus as having been carelessly handled by scribal copyists who popularized, simplified, and expanded the text. Gesenius concluded that the Masoretic text is almost invariably superior to the Samaritan. The scroll shares all the major typological features with the SP, including all the major expansions of that tradition where it is extant (twelve), with the single exception of the new tenth commandment inserted in Exodus 20 from Deuteronomy 11 and 27 regarding the altar on Mount Gerizim. Frank Moore Cross has described the origin of the Samaritan Pentateuch within the context of his local texts hypothesis. He views the Samaritan Pentateuch as having emerged from a manuscript tradition local to Palestine. The Hebrew texts that form the underlying basis for the Septuagint branched from the Palestinian tradition as Jews emigrated to Egypt and took copies of the Pentateuch with them. Cross states that the Samaritan and the Septuagint share a nearer common ancestor than either does with the Masoretic, which he suggested developed from local texts used by the Babylonian Jewish community. His explanation accounts for the Samaritan and the Septuagint sharing variants not found in the Masoretic and their differences reflecting the period of their independent development as distinct Egyptian and Palestinian local text traditions. On the basis of archaizing and pseudo-archaic forms, Cross dates the emergence of the Samaritan Pentateuch as a uniquely Samaritan textual tradition to the post-Maccabaean age. Scholars have tended to presuppose that the Samaritan Pentateuch consists of two "layers", one composed of the sectarian variants introduced by Samaritan scribes and a second layer reflecting the text's earlier transmission history as a "pre-Samaritan" Palestinian local text. In light of recent research "it is now clear that the Samaritan layer is very thin." Although the majority of scholars continue to favor the Masoretic as a superior text, many other scholars have now adopted Kahle's thesis. Scholars now widely agree though that many textual variants previously classified as "Samaritan" actually derive from even earlier phases of the Pentateuch's textual history. Kennicott's claim that Gerizim is the original reading continues to be a subject of discussion. Dead Sea Scroll fragment 4Q41(981) contains a text of Deuteronomy 5:1–25 which makes no reference to Mount Gerizim, but matches the Masoretic Text. The New Testament also agrees with the Masoretic version designating Jerusalem as the "chosen place". However, some scholars hold that Deuteronomy 27:4–7 constitutes one occasion where the Samaritan's "Gerizim" may be the original reading." The Samaritan Targum, composed in the Samaritan dialect of Aramaic, is the earliest translation of the Samaritan Pentateuch. Its creation was motivated by the same need to translate the Pentateuch into the Aramaic language spoken by the community which led to the creation of Jewish Targums such as Targum Onkelos. Samaritans have traditionally ascribed the Targum to Nathanael, a Samaritan priest who died circa 20 BCE. The Samaritan Targum has a complex textual tradition represented by manuscripts belonging to one of three fundamental text types exhibiting substantial divergences from one another. Affinities that the oldest of these textual traditions share with the Dead Sea Scrolls and Onkelos suggest that the Targum may originate from the same school which finalized the Samaritan Pentateuch itself. Others have placed the origin of the Targum around the beginning of the third century or even later. Extant manuscripts of the Targum are "extremely difficult to use" on account of scribal errors caused by a faulty understanding of Hebrew on the part of the Targum's translators and a faulty understanding of Aramaic on the part of later copyists. Scholia of Origen's Hexapla and the writings of some church fathers contain references to "the Samaritikon" (Greek: το Σαμαρείτικον)., a work that is no longer extant. Despite earlier suggestions that it was merely a series of Greek scholia translated from the Samaritan Pentateuch, scholars now concur that it was a complete Greek translation of the Samaritan Pentateuch either directly translated from it or via the Samaritan Targum. It may have been composed for the use of a Greek-speaking Samaritan community residing in Egypt. With the displacement of Samaritan Aramaic by Arabic as the language of the Samaritan community in the centuries following the Muslim conquest of Syria, they employed several Arabic translations of the Pentateuch. The oldest was an adaptation of Saadia Gaon's Arabic translation of the Jewish Torah. Although the text was modified to suit the Samaritan community, it still retained many unaltered Jewish readings. By the 11th or 12th centuries, a new Arabic translation directly based upon the Samaritan Pentateuch had appeared in Nablus. Manuscripts containing this translation are notable for their bilingual or trilingual character; the Arabic text is accompanied by the original Samaritan Hebrew in a parallel column and sometimes the Aramaic text of the Samaritan Targum in a third. Later Arabic translations also appeared; one featured a further Samaritan revision of Saadia Gaon's translation to bring it into greater conformity with the Samaritan Pentateuch and others were based upon Arabic Pentateuchal translations used by Christians. In April 2013, a complete English translation of the Samaritan Pentateuch comparing it to the Masoretic version was published. Several biblical commentaries and other theological texts based upon the Samaritan Pentateuch have been composed by members of the Samaritan community from the fourth century CE onwards. Samaritans also employ liturgical texts containing catenae extracted from their Pentateuch. I, Abishua,—the son of Phinehas, the son of Eleazar, the son of Aaron, unto them be accorded the grace of YHWH and His glory—wrote the holy book at the entrance of the tabernacle of the congregation, at Mount Gerizim, in the year thirteen of the possession by the children of Israel, of the Land of Canaan according to its boundaries [all] around; I praise YHWH. Interest in the Samaritan Pentateuch was awakened in 1616 when the traveler Pietro della Valle purchased a copy of the text in Damascus. This manuscript, now known as Codex B, was deposited in a Parisian library. In 1631, an edited copy of Codex B was published in Le Jay's (Paris) Polyglot by Jean Morin. It was republished in Walton's Polyglot in 1657. Subsequently, Archbishop Ussher and others procured additional copies which were brought to Europe and later, America. Until the latter half of the 20th century, critical editions of the Samaritan Pentateuch were largely based upon Codex B. The most notable of these is Der Hebräische Pentateuch der Samaritaner (The Hebrew Pentateuch of the Samaritans) compiled by August von Gall and published in 1918. An extensive critical apparatus is included listing variant readings found in previously published manuscripts of the Samaritan Pentateuch. His work is still regarded as being generally accurate despite the presence of some errors, but it neglects important manuscripts including the Abisha Scroll which had not yet been published at the time. Textual variants found in the Abisha scroll were published in 1959 by Federico Pérez Castro and between 1961 and 1965 by A. and R. Sadaqa in Jewish and Samaritan Versions of the Pentateuch – With Particular Stress on the Differences Between Both Texts. In 1976 L.F. Giron-Blanc published Codex Add. 1846, a Samaritan Pentateuch codex dating to 1100 CE in the critical edition Pentateuco Hebreo-Samaritano: Génesis supplemented with variants found in fifteen previously unpublished manuscripts. Certain recently published critical editions of Pentateuchal books take Samaritan variants into account, including D.L. Phillips' edition of Exodus. Several publications containing the text of the Samaritan Targum have appeared. In 1875, the German scholar Adolf Brüll published his Das samaritanische Targum zum Pentateuch (The Samaritan Targum to the Pentateuch). More recently a two volume set edited by Abraham Tal appeared featuring the first critical edition based upon all extant manuscripts containing the Targumic text. ^ a b Flôrenṭîn 2005, p. 1: "When the Samaritan version of the Pentateuch was revealed to the Western world early in the 17th century... [footnote: 'In 1632 the Frenchman Jean Morin published the Samaritan Pentateuch in the Parisian Biblia Polyglotta based on a manuscript that the traveler Pietro Della Valle had bought from Damascus sixteen years previously.]" ^ Anderson & Giles 2012, p. 150. ^ a b The Canon Debate, McDonald & Sanders editors, 2002, chapter 6: Questions of Canon through the Dead Sea Scrolls by James C. VanderKam, page 94, citing private communication with Emanuel Tov on biblical manuscripts: Qumran scribe type c.25%, proto-Masoretic Text c. 40%, pre-Samaritan texts c.5%, texts close to the Hebrew model for the Septuagint c.5% and nonaligned c.25%. ^ a b Gaster, T.H. "Samaritans," pp. 190–197 in Interpreter's Dictionary of the Bible, Volume 4. George Arthur Buttrick, gen. ed. Nashville: Abingdon, 1962. ^ a b Tov 2001, pp. 82–83. ^ Tov 2001, p. 83. ^ a b Buttrick 1952, p. 35. ^ Brotzman 1994, pp. 64–65. ^ Tov 2001, p. 81. "Only in recent generations have the Samaritans written a few manuscripts – only for use outside their community – with full vocalization." ^ a b c d e f Fallows, Samuel; Andrew Constantinides Zenos; Herbert Lockwood Willett (1911). The Popular and Critical Bible Encyclopædia and Scriptural Dictionary, Volume 3. Howard-Severance. p. 1701. ^ a b Hjelm 2000, p. 77. ^ Thomson 1919, pp. 286–289. ^ Thomson 1919, pp. 289–296. ^ Thomson 1919, pp. 296–301. ^ a b c d e f g h Vanderkam 2002, p. 93. ^ "Overview of the Differences Between the Jewish and Samaritan Versions of the Pentateuch". Web.meson.org. Retrieved 2011-12-05. ^ a b Soggin, J. Alberto (1989). Introduction to the Old Testament: From Its Origins to the Closing of the Alexandrian Canon. Westminster John Knox Press. p. 26. ISBN 9780664221560. "But there is at least one case, Deut.27.4–7, in which the reading 'Gerizim' in the Samaritan Pentateuch, confirmed by Σ and by the Old Latin, seems to be preferable to that of the Massoretic text, which has Ebal, the other mountain standing above Nablus." ^ "Exodus – Interlinear Pentateuch". Google. Retrieved 2014-01-05. ^ Thomson 1919, p. 312. ^ Vanderkam 2002, p. 94. ^ Easton, Matthew George (1897). "Samaritan Pentateuch" . Easton's Bible Dictionary (New and revised ed.). T. Nelson and Sons. ^ Barton 1903, p. 31. ^ Thomson 1919, pp. 312–313. ^ Du Pin, Louis Ellies (1699). A compleat history of the canon and writers of the books of the Old and New Testament, Volume 1. H. Rhodes. p. 167. ^ Pamphili, Eusebius (translator: Robert Bedrosian). "Eusebius' Chronicle: The Hebrew Chronicle". History Workshop. Retrieved 10 July 2012. ^ Montgomery 1907, p. 286. ^ Montgomery 1907, p. 288. ^ Thomson 1919, pp. 275–276. ^ Saebo, Magne (2008). Hebrew Bible / Old Testament: The History of Its Interpretation. Vandenhoeck & Ruprecht. ISBN 9783525539828. ^ Kennicott 1759, p. 32. ^ Kennicott 1759, p. 20. ^ Gesenius, Wilhelm (1815). De Pentateuchi Samaritani origine, indole et auctoritate commentatio philologico-critica. Halae. ^ Vanderkam 2002, pp. 92–93. ^ Kahle, Paul. Theologische Studien und Kritiken 88 (1915): 399–429. ^ Some examples include the Dead Sea Scroll manuscripts conventionally designated as 4QpaleoExodm, 4QExod-Levf and 4QNumb. See Vanderkam 2002, p. 95. ^ Tov 2001, p. 80. ^ Vanderkam 2002, p. 95. ^ Vanderkam 2002, p. 106. ^ Vanderkam 2002, p. 110. ^ Skehan, Patrick, Eugene Ulrich and Judith Sanderson (1992). Discoveries in the Judean Desert, Volume IX. Quoted in Hendel, Ronald S. "Assessing the Text-Critical Theories of the Hebrew Bible After Qumran," p. 284 in Lim, Timothy and John Collins (2010). The Oxford Handbook of the Dead Sea Scrolls. Oxford: Oxford University Press. ISBN 9780199207237. ^ Frank Moore Cross Harvard Theological Review July 1966 "The language of the Samaritan Pentateuch also includes archaizing forms and pseudo-archaic forms which surely point to the post-Maccabaean age for its date"
^ Crown 2001, p. 401. ^ Charlesworth, James H. "The Discovery of an Unknown Dead Sea Scroll: The Original Text of Deuteronomy 27?". Ohio Wesleyan Magazine. Archived from the original on 26 November 2015. Retrieved 11 October 2017. CS1 maint: BOT: original-url status unknown (link) A newly published Dead Sea Scroll fragment of Deuteronomy has "Gerizim" instead of "Ebal" in Deuteronomy 27:4. ^ a b c d Herbermann, Charles, ed. (1913). "Samaritan Language and Literature" . Catholic Encyclopedia. New York: Robert Appleton. ^ Crown 2001, p. 18. ^ Buttrick 1952, p. 57. ^ a b c Brotzman 1994, p. 66. ^ Marcos, Natalio (2000). The Septuagint in Context: Introduction to the Greek Version of the Bible. Brill. p. 168. ISBN 9789004115743. ^ Crown 2001, p. 23. ^ Crown 2001, p. 24. ^ Crown 2001, pp. 24–25. ^ Tsedaka, Benyamim; Sharon Sullivan (2012). The Israelite Samaritan Version of the Torah: First English Translation Compared with the Masoretic Version. Grand Rapids, Michigan, USA: Wm. B. Eerdmans Publishing Company. ISBN 9780802865199. ^ Montgomery 1907, pp. 293–297. ^ Montgomery 1907, pp. 297–298. ^ Barton 1903, p. 9. ^ Barton 1903, pp. 9–10. ^ Eshel 2003, p. 215. ^ Cowper, B. Harris (1863). Journal of Sacred Literature and Biblical Record. Williams and Norgate. p. 131. ^ Phillips, D.L. Hebrew-English: Paleo Exodus: Scripture at the End of the Iron II Period. Edwin Mellen, 2004. ^ Tal, Abraham F. (1981). The Samaritan Targum of the Pentateuch: a critical edition (2 vols. )(Texts and Studies in the Hebrew Language and Related Subjects, 5.). Tel-Aviv: Tel-Aviv University. Anderson, Robert T.; Giles, Terry (2012). The Samaritan Pentateuch: an introduction to its origin, history, and significance for Biblical studies. Society of Biblical Lit. ISBN 978-1-58983-700-3. Barton, William E. (1903). The Samaritan Pentateuch: The Story of a Survival among the Sects. Oberlin, Ohio: The Bibliotheca Sacra Company. Brotzman, Ellis R. (1994). Old Testament Textual Criticism: A Practical Introduction. Baker Academic. ISBN 9780801010651. Buttrick, George Arthur and board, eds. (1952). The Interpreter's Bible, Vol. 1. Nashville, Tennessee: Abingdon Press. Crown, Alan David (2001). Samaritan Scribes and Manuscripts. Mohr Siebeck. ISBN 9783161474903. Eshel, Esther and Hanan Eshel (2003). "Dating the Samaritan Pentateuch's Compilation in Light of the Qumran Biblical Scrolls." In Tov, Emmanuel; Eva Ben-David and Weston W. Fields. Emanuel: Studies in Hebrew Bible, Septuagint, and Dead Sea Scrolls in Honor of Emanuel Tov. Leiden: Brill. ISBN 9789004126794. Flôrenṭîn, Moše (2005). Late Samaritan Hebrew: A Linguistic Analysis Of Its Different Types. Brill. ISBN 9789004138414.
von Gall, August (1914). Der hebräische Pentateuch der Samaritaner. Töpelmann. Hjelm, Ingrid (2000). The Samaritans and Early Judaism: A Literary Analysis. Continuum International Publishing Group. ISBN 9781841270722. Kennicott, Benjamin (1759). The State of the Printed Hebrew text of the Old Testament. Oxford. Metzger, Bruce Manning; Michael David Coogan (1993). The Oxford Companion to the Bible. Oxford University Press. ISBN 9780195046458. Montgomery, James Alan (1907). The Samaritans, the Earliest Jewish Sect: Their History, Theology and Literature. The J.C. Winston Co.
Thomson, J.E.H. (1919). The Samaritans: Their Testimony to the Religion of Israel. Edinburgh and London: Oliver and Boyd. Tov, Emanuel (2001). Textual Criticism of the Hebrew Bible. Uitgeverij Van Gorcum. ISBN 9789023237150. Vanderkam, James; Peter Flint (2002). The Meaning of the Dead Sea Scrolls. Harper San Francisco. ISBN 9780060684655. Shoulson, Mark E, compiler. The Torah: Jewish and Samaritan versions compared (Hebrew Edition, 2008). Evertype. ISBN 1-904808-18-2 / ISBN 978-1-904808-18-3. Wikisource has the text of the 1905 New International Encyclopedia article Samaritan Pentateuch.